Huck wrote: Again to the math problem "55 possibilities" for two 10-sided dice. I think, you know the row (1)-3-6-10-15-21-28-36-45-55-66-78. The 55 possibilities for two 10-sided dice are not very surprising. Mitior officio redditur, ecce, lea! Gentler surgical office, behold, lea! Maybe "lea" is "lion" in some weird Latin case, I don't know. Perhaps it is Panofsky's way of thanking Moakley for her assistance in looking up the particular obscure member of the French nobility that she or someone there tracked down for him. But this is all a wild guess. An unanswered question, at least for me, from Moakley, is how much Durrieu, the only writer before her to talk in print about the Michelino deck, actually said. In particular, did he mention how the four orders of trumps linked to the four suits of birds? The reason I am asking is to be able to rule out Durrieu as a source for the idea, expressed on the Beinecke website, that the cards of the Cary-Yale do likewise, between its trumps and suits. Je m'attacherai seulement, dans l'artiste milanais en son temps si célèbre, et depuis lors si complètement oublié, à ce qui concerne sa pratique de l'art de la miniature. 1) Le mot Virtus doit être pris au sens qu'avait l'italien Virtu, force, énergie, puissance d'action. 3) Voir: Comte Emiliano di Parravicino, Three packs of Italian Tarocco Cards, dans le Burlington Magazine, t. III (n° de décembre 1903), p. 237-251. (4) Je vise la fameuse série des cartes dites de Charles VI. Certains critiques ont estimé que ces cartes étaient plutôt vénitiennes que milanaises; mais elles proviennent bien, en tout cas, du Nord de l'Italie. Voir, pour la reproduction de tous ces curieux spécimens rappelés ici, outre l'article du comte di Parravicino dans le Burlington Magazine, mentionné à la note précédente: Henri-René d'Allemagne, Les Cartes à jouer (Paris, 1906, 2 vol. gr. in-4°), 1. 1, 2e, 5e et 6' parties du chapitre 1". rien ne se rattache au jeu de cartes mythologique qu'avait peint Michelino. Ce jeu, fait par l'artiste pour le duc Filippo Maria Visconti, a complètement disparu. Nous n'avons que son souvenir dans une explication très ampoulée accompagnant la lettre d'envoi de ces cartes à la reine Isabelle de Lorraine (1). (1) Bibl. nationale de Paris, ms. latin 8745, fol. 1-3i. J'ai été le premier à signaler ce curieux texte dans une communication faite le 13 mars 1895 à la Société nationale des Antiquaires de France (Bulletin de cette Société pour 1895, p. 117). Cf. La Chronique des Arts , numéro du 23 mars 1895, p. 100, et mon travail sur Le Strabon du roi Rene, dans Le Manuscrit, .. II (1895), p. 18. L'album de l'Exposition de Turin en 1880 (L'Arte antica alla IVa Esposizione nazionale di Belle Arti in Torino, nel 1880, in-folio) donne, sur le milieu de la planche LXXII, la reproduction d'une belle carte à jouer qui porte la représentation de deniers aux effigie et nom du duc Filippo Maria Visconti. Mais la disposition de cette carte ne correspond pas à la description du jeu qu'avait peint Michelino. (...I shall concern myself only with the most famous Milanese artist of his time, since then completely forgotten, as regards his practice of the art of miniature. (1) The word Virtus must be taken in the sense that the Italian Virtu had: strength, energy, and the power of action. (3) See: Count Emiliano di Parravicino, "Three packs of Italian Tarocco Cards", in Burlington Magazine, t. III (December, 1903), p. 237-251. (4) I refer to the famous series of cards called of Charles VI. Some critics have believed that these cards were rather Venetian than Milanese; But they certainly come from the North of Italy. See, for the reproduction of all these curious specimens recalled here, besides the article of the Count of Parravicino in the Burlington Magazine mentioned in the preceding note: Henri-René d'Allemagne, Les Cartes à jouer (Paris, 1906, 2 vols. 1, 2, 5 and 6 of Chapter 1.
nothing is connected with the mythological pack of cards Michelino painted. This deck, made by the artist for the Duke Filippo Maria Visconti, has completely disappeared. We have only its memory in a very ample explanation accompanying the letter of dispatch of these cards to Queen Isabella of Lorraine. (1) Bibl. de Paris, ms. Latin 8745, fol. 1-3i. I was the first to point out this curious text in a communication made on March 13, 1895, to the Société Nationale des Antiquaires de France (Bulletin of this Society for 1895, p. Cf. La Chronique des Arts, issue of March 23, 1895, p. 100, and my work on The Strabo of King Rene, in Le Manuscrit, II (1895), p. 18. In the middle of plate LXXII, the album of the Turin Exhibition in 1880 (L'Arte antica alla IVa Esposizione nazionale di Belle Arti in Torino in 1880, in folio) reproduces a beautiful playing card which shows in the depictions of coins the likeness and name of Duke Filippo Maria Visconti. But the layout of this card does not correspond to the description of the game that Michelino painted. As you can see, there is no mention of the suit to trump correspondences. Durrieu does not mention suits at all. It is just as Moakley reported it, with a few additional comments, mostly in the footnotes. 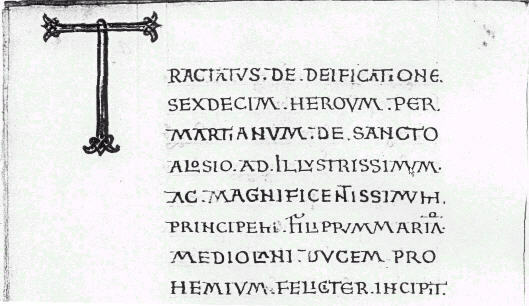 He does not even mention Marziano, who wrote the book, as stated on its title page (http://trionfi.com/0/b/p/marc-text3.jpg) that Marcello sent along with the deck. That Michelino's deck and Marziano's deck were one and the same was Moakley's surmise. It is true that Marcello does not mention Marziano by name as the "most learned" author of the book he is sending with the deck. That is because the author is given on the title page. Is it possible that he only found the Marcello letter, and not the Marziano book? Either way, we owe Durrieu our gratitude for discovering the two texts. I have not found online the other work he cites, of the same year, the article on the Strabo for Rene. But since Durrieu cites just one page, I presume it is similar to the other two. If so, it would appear that nothing about the correspondence of suits to trumps in Marcello's letter appeared in print prior to Franco Pratesi's article in 1989 (http://www.naibi.net/A/25-FIRSTARO-Z.pdf), who as may be seen has quite a bit to say about the relationship of trumps to suits, not only reporting what Marziano says but going beyond the letter to what may be inferred, or plausibly inferred, from his statements. The section of his article entitled "Discussion and Conclusion", which deals precisely with that point, is as cogent today as it was in 1989 and is well worth re-reading, along with Dummett's seldom-cited reflections on that article (granting that in light of the Marziano, that the Cary-Yale had 16 trumps is a "real possibility"), at http://askalexander.org/display/22601/T ... arziano%22.